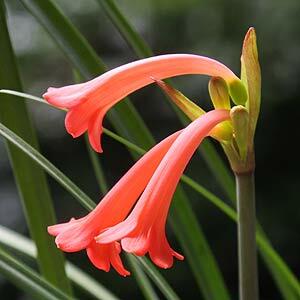 Cyrtanthus bulbs and species are a drought tolerant bulb or tuberous corm originally from South Africa. The species vary greatly in form with species such as C.carneus, C. mackenii, C. elatus also known as the Scarborough Lily or Vallotta Lily, C. falcatus with its nodding flower heads. C. breviflorus has nice yellow flowers, and are well worth a place in the garden. Most species are suitable for the rock garden or for growing in pots and bulbs are available for sale by mail oder from specialist Mail Order Nurseries. 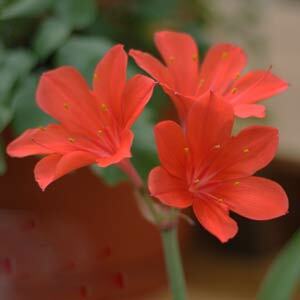 Cyrtanthus are probably best known for C. elatus also known as ‘Scarborough lily’ and previously identified as Vallotta elata. Most species are regarded as an easy care bulb, a few are regarded as difficult including C. obliquus and C. spiralis. Growing conditions for the rest of these bulbs is straight forward. Being originally from South Africa they are regarded as a drought tolerant bulb and require a sunny position and a well drained soil. All species can be grown in pots. These are another bulb that like to planted close to the surface, with the shoulders of the bulb at surface level. Sometimes they will drag themselves deeper depending on the climate. Like most bulbs they tend to find their own level after a year or two. A little top dressing with well rotted compost and manure applied in late winter seems sufficient fertiliser for most. C. brachyscyphus is semi evergreen growing to 30cm with red-orange flowers in late spring to summer. C. falcatus has flowers that hang from a tall stem, a most interesting form. C. herrei has a similar habit to C. falcatus but with more tubular flowers. C. obrienii – We believe we have this growing this one and it is pictured right. C. ventricosus – all worth searching for online, at plant fairs and from collectors. Tree Paeonies, South African Bulbs, Species Iris, Water Iris, Flag Iris, Daffodils, Other Bulbs & Perennials. Plants available by mail order or from Daylesford Sunday Market and Wesley Hill Market.